I recently met with Dr. Rajan to discuss alternative ways to treat my autoimmune condition in non-conventional ways. Immediately when meeting with Dr. Rajan, he took his time with discussing the importance of doing an elimination diet to find relief from my symptoms. He was very knowledgeable and also very sincere about wanting to help find relief for me. He provided me with supplements to help regulate my immune system. I liked that he had them readily available at his office and explained the dosage that I needed to take. 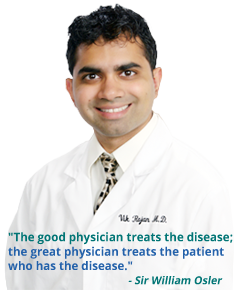 I appreciate Dr. Rajan’s medical background, along with his holistic approach to help you get better. Unfortunately, the doctors that I had seen before wanted to just treat me with NSAIDS’s and strong suppressing immune medications that would cause serious side effects that I did not want to risk having. I am excited to try everything he has recommended and see relief from chronic backache. I definitely recommend Dr. Rajan and his team. I was very pleased with the services he provided. There were several treatment options available for my condition and I had no idea which one was best. Dr. Rajan helped me sort through the pros and cons of each treatment. He did his research and provided me with the background information I needed to make an informed decision. Not only that, he helped me figure out which insurance carrier I should sign up with and which policy would afford me the highest level of benefits. I am happy to say that after employing the treatment he helped me decide was best for me, I have made a complete and full recovery. Thank you Dr. Rajan for a job well done! I thoroughly recommend Houston Patient Advocacy. A family friend recommended Dr. Rajan to me and my husband. I was initially hesitant to do a health review with him because I already had three doctors that I had been going to for a long time. I had been suffering with a lot of unexplained physical symptoms, so I decided to sit down and review my general health with him. It was a very educational experience. Besides the relief I felt getting everything health wise out on the table, I learned more about my health, my medications, and possible interactions. He even helped me come up with a plan of action for attacking some physical symptoms that I had been dreading and avoiding getting addressed. My physicians are great; however I couldn’t talk the medical talk to convey some of the quirks and symptoms I had been experiencing. Dr. Rajan came to several medical appointments with me as my advocate and helped me get the focused care I needed to improve my health. I now feel better than I have in a long time, and I like knowing more about my health and how I can be more in charge of it. They say knowledge is power! Thank you, Dr. Rajan for all your help. A friend of mine told me about Houston Patient Advocacy and Dr. Rajan a few months back as I was seeing 4 different specialists and taking 10 Rx’s daily. I had become frustrated with spending 15 minutes with these doctors on my frequent visits and concerned that some of my prescriptions might be interacting unfavorably with each other. After a very in depth initial meeting I left feeling like I finally had a doctor on my side. The idea of having one doctor who worked for ME and would comprehensively study all of my records from these doctors and put the pieces of the puzzle together just made sense. One example of how Dr. Rajan was instrumental in my being properly diagnosed was when I tried to get an appointment with a very well-known and respected neurologist that I really wanted to work with. (My first neurologist was stumped and just stopped communicating with me.) When I called for the appointment I was told he couldn’t see me for 3 months. Dr. Rajan called and I had an appointment in 4 days! He went with me to the appointment, took notes, and was able to explain everything to me in layman’s terms. Another example was at our second appointment to discuss tthe results of many tests including an LP (spinal tap). When the doctor came in, none of the results were in his computer. I was near tears as these tests results were going to determine or dispel my diagnosis of MS (multiple sclerosis). Dr. Rajan said he would make some phone calls and get the results to my neurologist ASAP. The neurologist agreed to let us wait in the room, and he would come back in 20 minutes. To everyone’s surprise, Dr. Rajan delivered on his promise and the neurologist was able to see my results and make his diagnosis 20 minutes later. I have MS. At this time, Dr. Rajan has done what he can to get me through the mire of red tape and get asnwers quickly – something that would have taken me months longer to achieve. I will always be grateful for his help and highly recommend him to anyone who may need his services. After initially meeting Dr. Rajan, I was intrigued by his unique apporach to helping individuals ensure they understand, in a clear cut way, their health issues. I went into Dr. Rajan’s office for my health review, and the first thing I noticed was that he was able to immediately put me at ease and make the consultation conversational. He does a very thorough job of truly understanding who you are from you medical background and history, as well as meshing with your personality, which allowed me to reveal things that I was not previously comfortable telling a doctor on an actual visit. The greatest takeaway from my time with Dr. Rajan was that I finally understood what previous doctors had told me in medical terminology that I didn’t understand and that they didn’t have time to explain. I truly believe Dr. Rajan and Houston Patient Advocacy are at the forefront of the next big revolution in healthcare. As a geriatric care manager, I participated in a health review with Dr. Rajan and my client. It was amazing. Dr. Rajan began with a health history. As my client answered questions I saw first hand how important it is for everyone to get a handle on what they may be prone to developing through their family tree. Dr. Rajan then went through my client’s current health concerns. These were the issues that my client was currently receiving treatment and medications for. It is what Dr. Rajan focused on next that I thought was amazing. He spent some quality time finding out about what might be classified as hunches, annoying symptoms, quirks, things going on in the body that one is not quite sure if they should be brought up in an office visit or not. Everyone can relate – these are the things in the back of one’s mind about their health that kind of nag and create anxiety. In the end, Dr. Rajan gave my client a list of concerns that should be followed up with her treating physician and a list of what she could do herself by adopting healthier habits. My patient was noticeably put at ease, educated and empowered by the end of the health review. 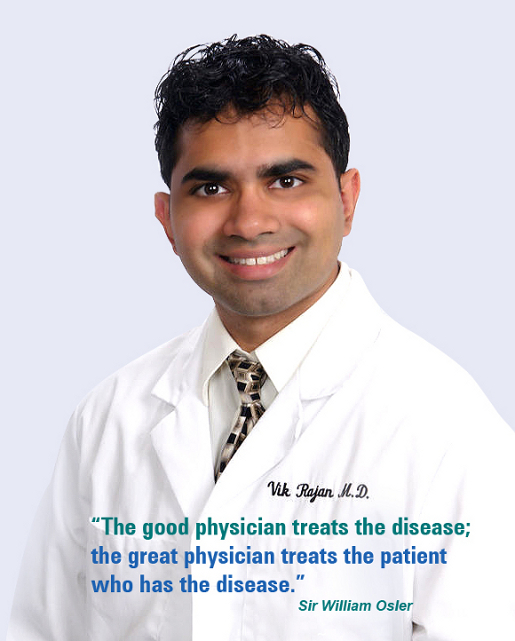 Thank you, Dr. Rajan, for patient advocacy at its best! Mary suffered an attack of severe vertigo late one night. Her doctor’s office was closed and the answering service advised her to go directly to the emergency room. After waiting several hours and undergoing expensive tests, Mary was told there was no obvious cause for her vertigo. She was given Antivert (an anti-dizziness medication) and told to contact her primary physician if the vertigo didn’t improve. Despite taking the medication, she continued to have symptoms and finally went to her doctor where Mary was later diagnosed with BPV (benign positional vertigo) – a condition easily treated by a series of head-turning maneuvers known as the Epley maneuver. Mary wasted $2500 (not covered by her insurance due to her deductible) and lost numerous hours on a medical workup that was unnecessary and nonproductive. Most importantly, Mary suffered unnecessarily for weeks. Liz also suffered an attack of vertigo. Her primary doctor couldn’t see her for a week, so Liz called Dr. Rajan, who was available that same day. He listened to her problems and informed Liz about the different potential causes of vertigo and how they are treated. Dr. Rajan suggested she go to an urgent care clinic for same-day treatment and ask about the possibility of benign positional vertigo (BPV). He also provided her written information about the Epley maneuver. Liz specifically asked the urgent care doctor about BPV and was confirmed to have it. She was treated with the Epley maneuver the same day, and by the evening, her vertigo was gone. Overall she paid far less than Mary did and received the correct diagnosis and relief of symptoms faster. Jerry was hospitalized with multiple medical problems, including cancer that required chemotherapy. After Jerry’s first round of chemotherapy, he suffered septic shock. (Sepsis is an infection that progresses quickly. Unless recognized and treated early, the infection can prove fatal.) It took Jerry nearly two weeks in intensive care to recover, leaving his out-of-state relatives deeply concerned about Jerry’s level of care and his vulnerability to future chemotherapy treatments. Jerry’s closest relative hired Dr. Rajan to serve as Jerry’s (and the family’s) on-site advocate. Dr. Rajan reviewed Jerry’s records and spoke with both the patient and his medical providers daily in order to communicate an ongoing updated status report to the patient and his family, as well as answer questions they may have. Following Jerry’s second round of chemotherapy, he appeared fine for the first couple of days, but later one afternoon he developed a slight fever of 100.0 degrees and his blood pressure was starting to trend downwards. Despite the impending danger, Jerry’s doctors were not yet alerted because based on the orders in the chart, his temperature was not high enough and blood pressure not low enough to require alerting his physicians. Dr. Rajan was visiting the patient that afternoon and recognized the worsening trend in vital signs and the need to alert his doctors sooner rather than later, so he called them directly to discuss the situation. A course of antibiotics was then immediately started, which prevented the devolopment of septic shock. The infection was successfully cleared in a few days. Cynthia had a surgery done at a hospital by a doctor who was in her insurance network. She was under the impression that the hospital was also in-network, but was surprised to learn it was not when she received a hospital bill of $43000, which represented the portion of charges not covered by her insurance. Cynthia was at a loss to know how to resolve this problem herself. Cynthia contacted Houston Patient Advocacy, where a medical billing expert took up her case and spoke to the insurance company and hospital on her behalf. The case was ultimately resolved in Cynthia’s favor with the hospital accepting out-of-network payment from her insurance company and reducing the charges owed by Cynthia to ZERO. Cynthia was elated with the outcome.